I love this time of year. Each season has it's joy, but the early springtime is full of hope. Highlights - the return of GREEN (moss covered rocks, first emerging seedlings), the proliferation of birdsong, and the smell of warm potting mix! We've begun planting in the hoophouse (carrots, scallions, pearl onions, and hakurei turnips), and our fall plantings of baby red Russian kale and spinach are thriving with the warmer days. On Sunday, we had our first CSA Core Group meeting. The Core Group acts as an advisory group to guide our CSA on its path of sustainability. A group of 10 of us (plus our youngest CSA member, baby Benjamin) talked about healthy food, healthy people, and building a healthy community. We're looking forward to more meetings of this group. If you are a CSA member and interested in being a part of this, let us know! 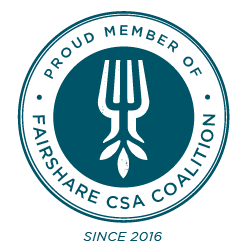 Interested in the CSA and haven't signed up yet? You can find our sign-up sheet here! Our next on-farm farmstand is next Tuesday, the 22nd, from 4-6pm. We'll have baby kale, spinach, red + yellow onions, red + French fingerling potatoes, carrots, beets, black turtle beans, Vermont cranberry beans, popcorn, and our pastured pork. (Anyone need an Easter ham??) All are welcome, and be prepared for some mud! Thank you for reading, and we hope to see you at the farm. We'll be having a Wildflower Walk & Ramp Harvest in April/May and few more farmstands before then.